I was looking for something mindless on TV a couple of nights ago and came across Living with Ed, a program about Ed Begley Jr., who is a bit of a nut on environmental issues. In the show, they installed a wind turbine on his house. Now I want one. I don't know if it would actually be cost efficient. I suspect that at almost $3,000 before installation, it would take a long time to pay it off. But damn. 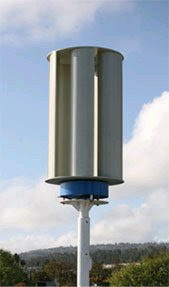 A wind turbine! Feeding electricity into my house and maybe, on a good day, back into the grid! The universe is just what is. But as human beings, we impose story on it. We arbitrarily decide that something 'began' at a certain point and 'ended' at a certain point. That's how we tell stories. It's hard for me to do that sometimes--especially with endings. I distrust endings in stories. But there are certain easily identifiable narrative endings in our experience. Death is the obvious one. The problem is, the narrative only has shape afterwards. Up until we die, there are only events, some predictable, some not. I'm acutely aware of that right now. Last night I got a call from the Assisted Living where my mother lives. She wouldn't eat her dinner or drink anything and an alert aide* took her back to her room and took her vitals. She had a temperature of 102. Last week they finally managed to get a urine sample from her (she kept dumping them out--it was clearly difficult for her to keep the point of this whole exercise in her mind) and she has a urinary tract infection. It's probably the cause of some increased confusion of late. So they put her on antibiotics. So they called me last night and told me that if she didn't respond to acetaminophen, they'd have to call the EMTs and send her to the hospital. Just like babies run fevers that would kill an adult, the elderly tend to run lower fevers than younger people, and 102 degrees in a 92 year old woman can signal a life threatening condition. I'm trying to impose narrative on all this. What does it mean? What do I do now? What could it signify for the near future. Well, right now, her fever is gone, she's back to normal this morning--whatever normal means for a 92 year old woman with dementia. But she's eating and talking to people. I can imagine her, back downstairs in the dining room in her ancient blue cardigan. (She only wears blue anymore.) And there's no narrative to this moment except the pattern we will see, or think we see, when at some point, we look back at all this. *Bless the women who tend my mother. Who watch over her. Who tell me when I call to check at 11:00 at night, 'You get some sleep, honey. We'll call you if anything comes up.' They take care of her for minimum wage. And they tease her and talk to her and keep an eye on her. All I can say is thank you. 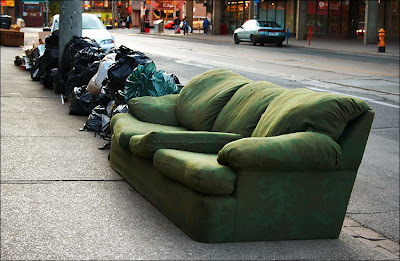 Although this couch is not from Adam's apartment, nor is this picture even from Adam's city, none the less, some furniture did go back out to the street from whence it came. Adam and friends are almost moved out. The U Haul is on it's way to a friend's new apartment, bearing with it the furniture that made the cut. The love seat that they got from the frat house--that's gone. Tomorrow we just hang out a bit and Tuesday I head home. This time through JFK instead of Cincinnati. I only hope Hurricane Dean doesn't keep me from getting to fly into Texas. The plane is coming into Cincinnati Airport, over the intense green of Kentucky. There is the Ohio River, and there is the interstate and I know that the interstate falls in a long hill down towards the river and then crosses into the city. There are so many rivers, the land is wrinkled with them. So familiar this place where I grew up, Cincinnati, this small town that happens to have a million people in it. A place I never wanted to be home because my life felt so small there and now it isn't because there is no family for me there anymore and yet it is so familiar that it is an ache. If I don't belong here, and nothing else is so achingly familiar, where do I belong? And we fall towards the green hills, and I remember my cousins flying in from Arizona and the youngest kept saying what is that? what is that? and they kept laughing and saying, trees! So much water on a green green land and, I told my students in China, those children of farmers, where I come from, the problem is not drought but drainage, and they laughed. And we touch down. I am here for thirty minutes, and then lifted away again, over a landscape, bird's eye view that no human should ever have expected to see. Icarus falling and lifted up again. Strange dislocations of technology. Temporarily homeless and in flight. But he's sick and he's broke. So I'm headed to Rochester this Friday. We've worked out plans to get his car fixed, get his stuff in storage, and get him in a hotel. Then I'll make him eat and sleep and watch TV until he goes off to the new job. Where he will probably spend a lot of his time really tired, poor kid. I am sorry for my protracted silence. I plead travel, unexpected work, and company. The travel was, well, travel. Anything involving airports should be passed over in silence. The the folk from Eat Our Brains came so I could cook for them. I got to make ox tail ragu with gnocchi. This weekend is ArmadilloCon. Then, I think, the quiet life for awhile.